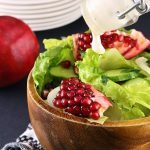 Red succulent pomegranate seeds make for one REALLY good tasting Pomegranate Salad that bursts with flavor. Romaine lettuce is tossed in a homemade Creamy Garlic dressing along with onions, cucumbers and pomegranate seeds. My cousin shared this recipe with me a while back and the good thing is you can absolutely double or quadruple this salad. A helpful tip to remember when going up in portion is to always use the same amount of sour cream and mayo, (1 to 1 ratio) for the dressing and of coarse garlic and seasoning to taste. But with that guide you can make almost any sized salad. With pomegranates in season right now, this salad is a must try! 1. Whisk together the dressing ingredients and refrigerate until needed. 2. In a large shallow serving bowl toss together the salad ingredients and coat with dressing right before serving. Whisk together the dressing ingredients and refrigerate until needed. In a large shallow serving bowl toss together the salad ingredients and coat with dressing right before serving.